Maeve O’Meara ventures into the beautifully healthy world of Korean food, full of color and surprises. Martial arts champion and top Adelaide chef Chung Jae Lee of Mapo restaurant reveals the basic ingredients needed for his cuisine amongst the Korean grocery stores and the fruit and vegetable stalls of Adelaide's vibrant Central Market. 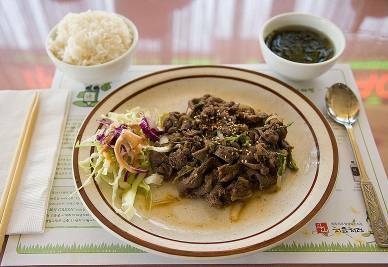 He cooks up a simple delicious bulgogi—a beloved marinated beef dish eaten rolled up in lettuce leaves. Chris Kang explains Korean people's devotion to the fermented vegetable kimchi, and explains how his grandmother has been making it since she arrived in Australia. Suzannah Kim, who cooks every day in her restaurant in Sydney's Little Korea in Campsie, whips up a traditional favorite, easy enough to make at home—a rice, vegetable and beef dish called bibimbap. Maeve visits her friend, Joo Kim, who has been making tofu for many years, and joins the elegant Yuni Choi for some lessons in how to eat Korean food at a traditional BBQ restaurant and not look silly. We finish at a rice cake factory and see how stone-ground rice is steamed with a variety of fillings including nuts, beans and herbs to make the soft low-fat cakes that are prized for festivals and special occasions. Click here for the recipes featured in this episode. Korea is a region and former country of East Asia that was unified under one state, but now divided into two separate states—North Korea and South Korea—as a result of the Korean War (1950–53). Located on the Korean Peninsula, Korea is bordered by People's Republic of China to the northwest, Russia to the northeast, and is separated from Japan to the east by the Korea Strait and the Sea of Japan (East Sea). Korean history begins with the founding of Gojoseon in 2333 BC by the legendary Dan-gun. Following the unification of the Three Kingdoms of Korea under Silla 668 AD, Korea went through the Goryeo Dynasty and Joseon Dynasty as one nation until the end of the Korean Empire in 1910, when Korea was annexed by Japan becoming part of the Japanese Empire, and remained so until Korea's liberation and occupation by Soviet and U.S. forces at the end of World War II in 1945. These two Cold War rivals then established governments sympathetic to their own ideologies, leading to Korea's current division into two political entities: North Korea and South Korea. The ensuing conflict between the two was largely a proxy war. Historically, Korea has had close relations with China. Before the formation of South Korea, Korean independence fighters worked with Chinese soldiers during the Japanese occupation. However, after World War II, the People's Republic of China embraced Maoism while South Korea sought close relations with the United States. After the invasion of South Korea by forces from the North in 1950, the resulting war between the two Koreas ended with an Armistice Agreement, but the border between the two nations, referred to as the Korean Demilitarized Zone or "DMZ", is the most heavily militarized border in the world. After the Korean War, the South Korean economy grew significantly and the country transformed into a major economy, a full democracy, and a regional power in East Asia. Today, South Korea, officially the Republic of Korea, is Asia's fourth largest economy and the world's 15th (nominal) or 12th (purchasing power parity) largest economy. The economy is export-driven, with production focusing on electronics, automobiles, ships, machinery, petrochemicals and robotics. Seoul is the capital and largest city of South Korea. A megacity with a population of over 10 million, it is one of the largest cities in the world. Nearly a quarter of South Korea's population live in Seoul itself, making it the country's foremost economic, political, and cultural center. Seoul has been a major settlement for over 2,000 years, with its foundation dating back to 18 B.C. when Baekje, one of the Three Kingdoms of Korea, established its capital in what is now south-east Seoul. It continued as the capital of Korea during the Joseon Dynasty and the Korean Empire. Today, Seoul is considered to be a leading global city, ranking among the top ten global cities in the Global Cities Index of 2010. It is one of the world's top ten financial and commercial centers, home to major multinational conglomerates such as Samsung, LG and Hyundai-Kia. Although a variety of different Asian peoples had migrated to the Korean Peninsula in past centuries, very few have remained permanently, so by 1990 both South Korea and North Korea were among the world's most ethnically homogeneous nations. The number of indigenous minorities was negligible. In South Korea, people of foreign origin, including Chinese, Japanese, Westerners, Southeast Asians, South Asians and others were a small percentage of the population whose residence was generally temporary. Against the background of ethnic homogeneity, however, significant regional differences exist, and interregional marriages are rare. The Korean language is spoken by the vast majority of the population. South Korea shares its traditional culture with North Korea, but the two Koreas have developed distinct contemporary forms of culture since the peninsula was divided in 1945. Historically, while the culture of Korea has been heavily influenced by that of neighboring China, it has nevertheless managed to develop a unique and distinct cultural identity from its larger neighbor. The South Korean Ministry of Culture, Sports and Tourism actively encourages the traditional arts, as well as modern forms, through funding and education programs. In 2007, 6.4 million foreign tourists visited South Korea, making it the 36th most visited country in the world, and this number was expected to exceed 8.5 million in 2010. Japan, China, Hong Kong and Taiwan together account for roughly 75% of the total number of international tourists. In addition, the Korean wave has brought increasing numbers of tourists from Southeast Asia. 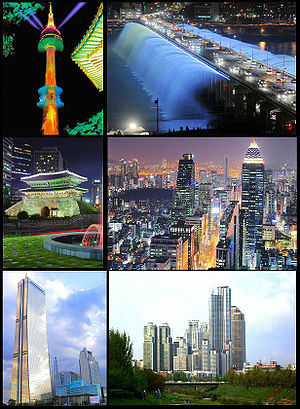 Seoul is the principal tourist destination for visitors. In 2008, Seoul was named the world's sixth most economically powerful city by Forbes. Seoul is also home to four UNESCO World Heritage Sites: Changdeokgung, Hwaseong Fortress, Jongmyo Shrine and the Royal Tombs of the Joseon Dynasty. Korean cuisine originated from ancient prehistoric traditions in the Korean peninsula and southern Manchuria, evolving through a complex interaction of environmental, political, and cultural trends. The Korean War (1950–1953) and the Cold War separated the country into North Korea and South Korea. In the 1960s under President Park Chung Hee, industrialization began to give South Korea the economic and cultural power it holds in the global economy today. Korean cuisine is some of the healthiest on earth, with an emphasis on vegetables, meats cooked simply and without much oil and a near obsession with the fermented vegetable kimchi. 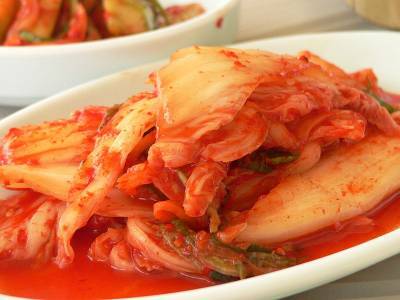 Kimchi is pickled vegetables which contain vitamin A and C, thiamine, riboflavin, iron, calcium, carotene, etc. There are many types of kimchi including cabbage kimchi, string onion kimchi, cucumber kimchi, radish kimchi, and sesame kimchi. The main ingredients in kimchi are smashed ginger, chopped radish, salt pickled small shrimps, and fish sauce. Much of the food that exists today and the customs surrounding it have come from Korean royal court cuisine and the complex customs of the ancient court. Meals are regulated by Korean dining etiquette. The table setup is important as well, and individual place settings, moving from the diner's left should be as follows: rice bowl, spoon, then chopsticks. Hot foods are set to the right side of the table, with the cold foods to the left. Soup must remain on the right side of the diner along with stews. Vegetables remain on the left along with the rice, and kimchi is set to the back while sauces remain in the front. Korean food is a study in balance with consideration given to temperature, spiciness, color and texture along with careful presentation. Starting with ritual bowls of rice and soup, the meal is built around numerous shared side dishes (banchan), each carefully selected to complement the other. One constant is the presence of the beloved kimchi which is adored for its sour tangy crunch as well as being a digestive aid. Many Koreans say they just don't feel right without kimchi and feel weak and unwell without it. Korean cuisine is largely based on rice, noodles, tofu (in Korean, dubu), vegetables, and meats. Ingredients and dishes vary by province. Commonly used ingredients include sesame oil, doenjang (fermented bean paste), soy sauce, salt, garlic, ginger, pepper flakes and gochujang (fermented red chili paste). Many Korean regional dishes have become national, and dishes that were once regional have proliferated in different variations across the country. Traditional dishes include ssambap, bulgogi, sinseollo, kimchi, bibimbap, and gujeolpan. The main crops in Korea are rice, barley, and beans, but many supplementary crops, such as wheat, sorghum, and buckwheat, are used. Rice is the staple food of Korea. Having been an almost exclusively agricultural country until recently, the essential dishes in Korea are shaped by this experience. The most traditional method of cooking the rice has been to cook it in an iron pot called a sot or musoe sot. Soybeans have been significant crops in Korean history and cuisine. They are made into tofu (dubu), while soybean sprouts are sauteed as a vegetable (kongnamul) and whole soybeans are seasoned and served as a side dish. They are also made into soy milk, which is used as the base for the noodle dish called kongguksu. A byproduct of soy milk production is okara (kongbiji), which is used to thicken stews and porridges. Soybeans are also the primary ingredient in the production of fermented condiments collectively referred to as jang, such as soy bean pastes, doenjang and cheonggukjang, a soy sauce called ganjang, chili pepper paste or gochujang and others. Mung beans (nokdu) are commonly used in Korean cuisine. Mung bean sprouts, called sukju namul, are often served as a side dish, blanched and sautéed with sesame oil, garlic, and salt. Ground mung beans are used to make a porridge called nokdujuk, which is eaten as a nutritional supplement and digestive aid, especially for ill patients. A popular snack, bindaetteok (mung bean pancake) is made with ground mung beans and fresh mung bean sprouts. Starch extracted from ground mung beans is used to make transparent cellophane noodles (dangmyeon). The noodles are the main ingredients for japchae (a salad-like dish), and sundae (a blood sausage) or a subsidiary ingredient for soups and stews. Modern Korean cuisine includes a number of meat-based dishes. Beef is the most prized of all meats, with the cattle holding an important cultural role in the Korean home. The importance of cattle does not suggest Koreans ate an abundance of beef, however, as pork and seafood are more likely consumed on a more regular basis, as the cattle were valued as beasts of burden. Only in the latter part of the 20th century has beef become regular table fare. Beef is prepared in numerous ways today, including roasting, grilling (gui) or boiling in soups (guk). Chicken is often served roasted or braised with vegetables or in soups. All parts of the chicken are used in Korean cuisine, including the gizzard, liver, and feet. The feet of the chicken, called dakbal, are often roasted and covered with hot and spicy gochujang-based sauce and served as an anju, or side dish, to accompany alcoholic beverages, especially soju. Pork has also been another important source of protein for Korea. All parts of the pig are used in Korean cuisine in a variety of cooking methods including steaming, stewing, boiling and smoking. Fish and shellfish have been a major part of Korean cuisine because of the oceans bordering the peninsula. Both fresh and saltwater fish are popular, and are served raw, grilled, broiled, dried or served in soups and stews. Common grilled fish include mackerel, hairtail, croaker and Pacific herring. Smaller fish, shrimp, squid, mollusks and countless other seafood can be salted as jeotgal. Fish can also be grilled either whole or in fillets as banchan. Dried anchovies, along with kelp, form the basis of common soup stocks. Shellfish is widely eaten in all different types of preparation. They can be used to prepare broth, eaten raw with chogochujang, which is a mixture of gochujang and vinegar, or used as a popular ingredient in countless dishes. Raw oysters and other seafood can be used in making kimchi to improve and vary the flavor. Salted baby shrimp are used as a seasoning agent, known as saeujeot, for the preparation of some types of kimchi. Large shrimp are often grilled as daeha gui or dried, mixed with vegetables and served with rice. Mollusks eaten in Korean cuisine include octopus, cuttlefish, and squid. Korean cuisine uses a wide variety of vegetables, which are often served uncooked, either in salads or pickles, as well as cooked in various stews, stir-fried dishes, and other hot dishes. Commonly used vegetables include Korean radish, Napa cabbage, cucumber, potato, sweet potato, spinach, scallions, garlic, chili peppers, seaweed, zucchini, mushrooms and lotus root. Several types of wild greens, known collectively as chwinamul, are a popular dish, and other wild vegetables such as bracken fern shoots (gosari) or Korean bellflower root (doraji) are also harvested and eaten in season. Koreans place importance on food as medicine, using exotic ingredients such as dried persimmon, Chinese dates (jujube), pine seeds, chestnut, gingko, tangerine, ginseng, reishi mushrooms, and wolfberry in their cooking and also in specially brewed teas. Traditional rice cakes, tteok and Korean confectionery hangwa are eaten as a dessert or snack. Honey or another soft sweet material such as sweetened sesame or black beans are used as fillings. A tteok is served either filled or covered with sweetened mung bean paste, red bean paste, mashed red beans, raisins, a sweetened filling made with sesame seeds, sweet pumpkin, beans, jujubes, pine nuts, and/or honey. On the other hand, hangwa is a general term referring to all types of Korean traditional confectionery. The ingredients of hahngwa mainly consist of grain flour, honey, yeot, and sugar, or of fruit and edible roots. Tea was introduced in Korea, when Buddhism was introduced from China, and later gave rise to the Korean tea ceremony. A great number of teas made of fruits, leaves, seeds or roots are enjoyed. There are five distinctive flavors among the many various Korean teas: sweet, sour, salty, bitter, and pungent. Tea can be served hot or cold. While soju is the best known liquor, there are well over 100 different alcoholic beverages, such as beers, rice and fruit wines, and liquors produced in South Korea. Soju is a clear spirit which was originally made from grain, especially rice, and is now also made from sweet potatoes or barley. Soju made from grain is considered superior. Soju is around 22% ABV, and is a favorite beverage of hard-up college students, hard-drinking businessmen, and blue-collar workers. AFRICAN: Wherever you are in Africa, no meal is complete without a starchy porridge known as fufu. BRAZILIAN: An exuberant, colorful mix of Portuguese, African and native foods including some from the Amazon. CHINESE: Two thirds of households own a wok and use it regularly, but not everyone knows how to use it properly. EGYPTIAN: Beans are used extensively and creatively as a source of protein, fibre, and comfort. ENGLISH: "Meat & three veg" originated in the UK with dishes like roast beef, steak and kidney pie, and many more. FRENCH: The French have elevated food into an art form. Nowhere else is so much attention paid to what people are going to eat and how. HUNGARIAN: A fusion of simple peasant food & the elegant, highly developed cuisine from the days of the Austro Hungarian Empire. INDIAN: A vibrant, intensely colorful cuisine. Each region of India has its own style of cooking and distinct flavors. INDONESIAN: One of the most vibrant and colorful cuisines in the world, full of intense flavor and varied textures. ITALIAN: An long-awaited introduction to the kitchens and restaurants of Australia’s top Italian chefs and home cooks. JAPANESE: Refined and elegant, its preparation and presentation honed over the centuries so its flavors are pure and delicate. JEWISH: While flavors of the Jewish palate are influenced by geography, the constant for Jews all over the world are the Kosher laws. LEBANESE: Lebanese cuisine is generous and abundant, and this is some of the most exquisite food in the world. MALTESE: The rocky island of Malta is home to some beautiful rustic recipes that sing of Mediterranean flavor and freshness. MEXICAN: Authentic Mexican food is vibrant, spicy, delicious and fun. It varies according to which region its from. MOROCCAN: One of the most cleverly balanced cuisines on earth; spices are used to enhance the flavor of dishes. PAKISTANI: Full of marvelous and diverse dishes, it incorporates elements from its neighbors India, Afghanistan and Iran. PERSIAN: From simple dips to hearty stews, food preparation is taken very seriously in Iran and is often a labor of love. SOUTH AMERICAN: A fantastic fusion of culinary traditions from indigenous Indians, imported Africans, and the Spanish and Portuguese colonist. SRI LANKAN: This beautiful spice island is a rich melting pot of every nationality that has visited and traded with it over the years. SYRIAN: One of the highlights of Syrian food is mezza, a generous spread of small dishes and the prelude to even more food! TURKISH: Nestled between Asia and Europe, Turkish food is an unique and exotic fusion with influences from many countries.